February 24, 2019, the historic First Unitarian Church of Oakland celebrates our 150th Anniversary and looks to the heritage and future of the city we love. With Revs. Rob and Janne Eller-Isaacs, Pastor Jacqueline Duhart, and Rev. Sheri Prud’homme. Our final guest speakers in our month of celebration are Revs. Janne and Rob Eller-Isaacs, who served the congregation from the mid-1980s until 2000. Nothing truly significant can be accomplished in just one generation. Religious communities at their best provide a gracious container in which core values can be conveyed from generation to generation. For 150 years the First Unitarian Church of Oakland has been just such a container. Janne and Rob return to our pulpit after almost twenty years to look back and look forward at the ways in which liberal religious values have shaped the city they still dearly love. Joyful Noise will open the service and Crescendo Choir will sing. Rev. Rob will offer a story for all ages called “Back to the Common”. local dignitaries such as Mayor Libby Schaff, Senator Nancy Skinner, and Congresswomen Barbara Lee be part of the celebration. To mark the occasion, the congregation will also honor our community partners: Boost! West Oakland; McClymonds Merit Scholarship Fund; Starr King School for the Ministry; Interfaith Movement for Human Integrity; Genesis; and the Ella Baker Center for Human Rights. “Through all the changes that transformed downtown Oakland in the last 150 years, First Unitarian Church has remained relevant and part of our rapidly changing city,” said Rev. Dr. Sheri Prud’homme, the Church’s Minister for Faith Development. Rev. Prud’homme’s book about the Church’s history from 1869, Gather the Spirit, will be released at the celebration. Since 2000 Reverends Rob and Janne Eller-Isaacs have been Senior Co-Ministers of Unity Church-Unitarian in Saint Paul, Minnesota. Rob was called to serve the Oakland Church in the fall of 1982 becoming the first Unitarian Universalist Urban Extension minister. Janne, a psychotherapist before going into the ministry, having graduated from Starr King School, was ordained by the Church in April of 1987 having joined Rob as Co-Minister in the fall of the previous year. Together, they introduced the concept of shared ministry gathering a vibrant, responsive, hard-working congregation that both served the community and helped to spark the renaissance of downtown Oakland. 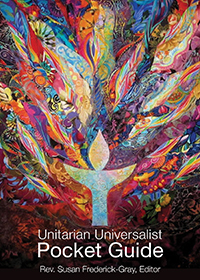 They raised their three children in the embrace of the Oakland congregation and are proud to report that all three remain dedicated Unitarian Universalists.